In Norfolk, Quakers agreed to give financial and practical support to Occupy Norwich, after hearing about the group at their Area Meeting for business. They were informed by their representative to Meeting for Sufferings. (Meeting for Sufferings is a standing representative body entrusted with the care of the business of the Britain Yearly Meeting through the year. Meeting for Sufferings first met in 1675. Its original purposes included obtaining redress from both parliament in cases of individual suffering and seeking to liberalise the laws relating to religious toleration – hence the name.) Friends also heard about the Britain Yearly Meeting statement on Occupy and a report on Norwich Occupy’s activities so far. 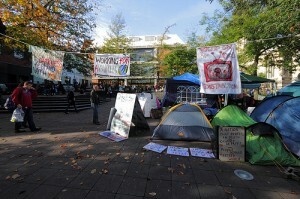 Occupy Norwich. Photo: Roger Blackwell CC. In London, a weekly Meeting for Worship has been established alongside Occupy, currently meeting on Sundays at 3pm by saint Paul’s cathedral. Staff from Turning The Tide were invited to give training to protestors early on in the camp’s existence. Materials from Quaker work on the Zero Growth economy have also been shared. Quakers in Wimbledon, Ditchling, Stevenage and Bury St Edmunds have signed a statement of Christian solidarity with Occupy, as has Nayler and Ipswich & Diss Area Quaker Meeting has also backed the statement. Oxford Friends issued a statement in support of the Meeting for Worship at Occupy: http://www.nayler.org/?p=424. Quakers & Business group has also issued a statement in support of the global Occupy movement. A Facebook group for Quakers in Occupy has also been set up. This post will be updated soon. Contact Jez at Nayler if you have more information about Quakers involved in Occupy or leave a comment below. Also: the statement by Oxford Meeting in support of Occupy LSX and upholding the Quaker meeting there. Thanks for the reminder about that.